It wasn’t until the 1940’s that what we think of as the “commando” or special forces units were standardized by the British Army. With the goal of disrupting German forces in western France and later in the Mediterranean and North Africa, the first commando units were modeled on small groups of Arab fighters who had great success pinning down much larger British Army units during the uprisings in Palestine in the 1930’s. These units proved to be very effective during World War II and have since become a staple of modern warfare. Today, the U.S. empire largely projects military force through targeted special forces operations and bombing campaigns, rather than outright warfare and traditional military maneuvers. Our planet is on the verge of total ecological collapse. Nothing is getting better. Governments and corporations continue business as usual while every day, carbon dioxide levels rise, forests are cut down, and 200 species are driven extinct. Forty percent of all human deaths can be attributed to pollution. Ocean fish may not exist by 2050. Even in ecological preserves, life is suffering; there has been an 85% decline in mammals in West Africa’s parks. Major dams continue to be built. Environmentalists being are murdered around the world. African lions are in precipitous decline, as are tigers, leopards, elephants, polar bears, rhino, and countless other species. Most of the species who are driven extinct haven’t even ever been described by western science; they slip into extinction with barely a ripple. Our few, hard-won victories are temporary. Protections can be (and are) revoked. Ground can be lost. Despite all we have done, life on this planet is slipping away. Small forces of ecological commandos could reverse this trend by targeting the fundamental sources of power that are destroying the planet. We have seen examples of this. 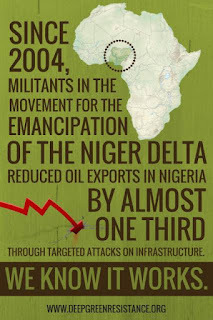 In Nigeria, commando forces have been fighting a guerrilla war of sabotage against Shell Oil Corporation for decades. At times, they have reduced oil output by more than 60%. No environmental group has ever had that level of success. Not even close. In the U.S., clandestine ecological resistance has been relatively minimal. However, isolated incidents have taken place. A 2013 attack on an electrical station in central California inflicted millions of dollars in damage to difficult-to-replace components used simple hunting rifles. The action took a total of 19 minutes, displaying the sort of discipline, speed, and tactical acumen required for special forces operations. Mobility and secrecy are critical to the success of special forces. Therefore, physical fitness, as well as the use of appropriate aids, such as helicopters, bicycles, or pack animals, is essential. Commandos must be prepared to climb barriers, crawl, swim, carry heavy objects, endure long distance travel, maintain stillness, and so on. Competency in firearms, knives, explosives, unarmed combat, and other handheld weapons are essential to these types of missions. Commandos must be capable of evading superior forces. This means they must have the ability to move silently and swiftly, and to hide in a variety of terrain. They should also be capable of killing or capturing opponents quickly and silently. However, stealth—the ability to avoid enemies—is more important than combat; fighting should only occur as a last resort. According to the book Deep Green Resistance, thus far the definitive resource on environmental sabotage, ecological commandos should seek to avoid causing casualties to avoid alienating the public further. Darkness is the element of choice for special forces units. Adverse weather can provide additional cover and opportunity. Therefore, units should train to operate in such conditions. Objectives often will be more accessible via water. Communications during operations may be impossible, and comms equipment is always subject to failure. Special forces must be prepared with a plan. However, they should have a good understanding of mission objectives and be prepared to improvise. Unlike traditional military forces, commando units typically form small squads of 2-12 individuals. Multiple squads may come together for some operations, but small unit size allows faster reaction time and greater operational flexibility—critical in asymmetrical conflict. Special forces engaged in sabotage often split into two forces: one focused on demolitions, the second on covering the demolition force. Units in the field are supported by medical teams, researchers, supply officers, and other support staff at secure positions. Traditional military units operate by seizing and holding territory. Since special forces rely on tactical rather than strategic advantages, a different approach is needed. Commandos generally focus on high-value targets like supply lines, fuel depots, communications hubs, important propaganda targets, unprepared foes, and so on. Attacking such targets can destroy the enemy’s ability to fight. Clandestine units are always focused on attack, and not defense. The success of special forces operations depends largely on good intelligence. Gathering information about target locations, defenses, surveillance, cover, enemy reinforcements, escape routes, transportation options, weather, and so on is essential. Our situation is desperate. Things continue to get worse. False solutions, greenwashing, corporate co-optation, and rollbacks of previous victories are relentless. Resistance communities are fractured, isolated, and disempowered. However, the centralized, industrialized, and computerized nature of global empire means that the system is vulnerable. Power is mostly concentrated and projected via a few systems that are vulnerable. Even powerful empires can be defeated. But those victories won’t happen if we engage on their terms. 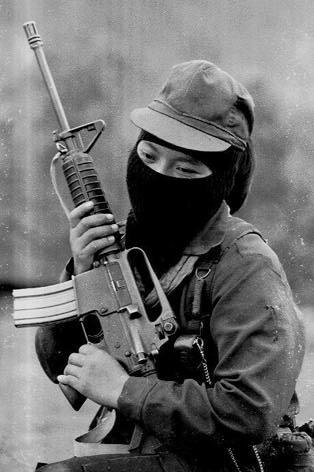 Ecological special forces provide a method and means for decisive operations that deal significant damage to the functioning of global capitalism and industrialism. With enough coordination, these sorts of attacks could deal death blows to entire industrial economies, and perhaps (with the help of aboveground movements, ecological limits, and so on) to industrialism as a whole. Implementation of this strategy will require highly motivated, dedicated, and skilled individuals. Serious consideration of security, anonymity, and tactics will be required. But this system was built by human beings; we can take it apart as well.